420 Project presented by Ratatouille, is where four stand-up comics make you laugh for 20 mins each. With such funny comics ending your week has never been better, what more can you ask for! Come and bring all your friends for this fun experience of constant laughter. Raunaq Rajani is a known comic artist. He has done many stand-up shows. 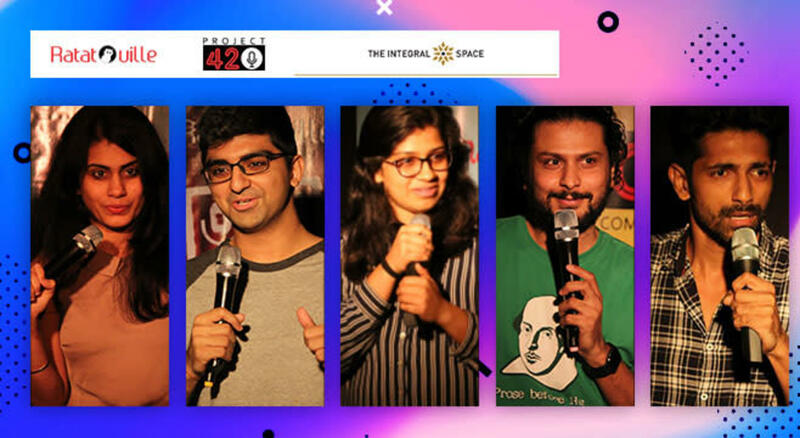 A few to name are Open Mic + New Stuff, Best in Stand-up with Rahul Subramanian, Raunaq Rajani, Vinay Sharma and Andy Reghu, The Leftovers: Sindhi Quota, Best In Stand-Up with Tushar Singh, A Culture Shoq Stand-Up Guys Show With Raunaq Rajani, Navin Noronha and Vinay Sharma, A Culture Shoq Stand-Up Guys Show with Raunaq Rajani, Abbas Momin and Naveen Polishetty, Culture shoq's 18+ College Humour, Comedy on the Big Mic with Raunaq Rajani and Best in Stand-Up with Raunaq Rajani. Neville Shah is a writer and one of India's most popular comics. A regular at the Canvas Laugh Club, he has performed both in India and abroad. He is half-Parsi and half-Gujarati, making him very confused and very angry. Often deprecating, Neville has a unique (read: strange) view on life. His insightful wit, conversational delivery and honest angst make his humor relatable and sometimes, oddly poignant. He also insists that he is his mother's son.